To create real social change in our communities, we need to build a strong membership base. FIERCE builds our membership base through street outreach, monthly base-building events, and presentations at LGBTQ youth service organizations. FIERCE has reached thousands of LGBTQ youth of color in NYC with our membership base exceeding 1300 LGBTQ youth of color. FIERCE has developed our own unique style of outreach through established social networks (in-person and online) and by engaging other LGBTQ youth in the language, culture and style that is specific to our community. FIERCE members who are dedicated to building our membership base, leading our campaign work and engaging in media projects. FIERCE members participate and lead trainings on how to do outreach. We do regular street outreach, flyer drop offs, and workshops at other organizations & Gay-Straight-Alliance groups in High Schools about FIERCE's work. 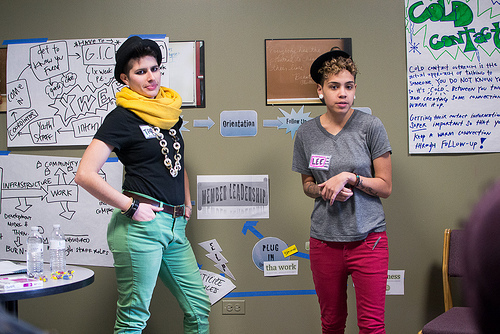 FIERCE is also available to do presentations at your organization or high school to talk to LGBTQ youth about FIERCE. We want to reach as many LGBTQ youth as possible and build relationships with groups who support our work. If you would like FIERCE to lead a presentation at your organization or school, contact Organizer Lee Jimenez. To learn more about FIERCE membership and how we build our base, check out this youth-produced video created by FIERCE Member Karen Hall. Want to know what FIERCE is up to? Want to meet more members? Are you new and wanna get down? Are you a member and haven't been around for a minute? Membership Meeting are a great way to GET INFORMED and GET INVOLVED! Parties, open mics, speak outs, workshops, discussions, movie nights - FIERCE Friday is where it's going down! Come meet other FIERCE members and chill out over some grub and peace conversation. Time to politick over the issues that mean most to us. This is a space where we talk deeper than what's on the surface, and dissect why we experience some of the messed up things we go through. Let's Politik events feature exciting workshops that deal with sexuality, gender, gender identity, race, and more. It is always great to be able to have political discussions, go to major actions and help spread the work of FIERCE. However it is also great to make sure you are keeping yourself well while doing that. This is a space to meditate, center yourself, learn self-defense, maintain healthy relationship, rejuvanate in the beach while working out. STAY HEALTHY!